As a QRP and milliwatt enthusiast I reduce my power, when the conditions go up. When I work with low power, I always use search and pounce. From time to time I also called CQ with 800 mW, but without success. The reason that I could not make any QSO in this way, is probably the activity. I heard stations calling CQ for a wile and then this station would leave the frequency after a few tries. After this run the 20 meter band was empty. hi. Early in the contest, after two QSO's with 360 mW, the signal of YQ6A was very strong. An earsplitting S+ +20 dB. This is S+ through the attenuator of 20 dB. I made the QSO with 8 milliwatts by answering CQ. Making a more than 1000 Miles per Watt QSO's is not as difficult as it seems. When you use a power of 800 mW, all QSO's over a distance of more than 800 miles will be more than 1000 Miles per Watt QSO's. Just notice, what your S-meter shows you. hi. 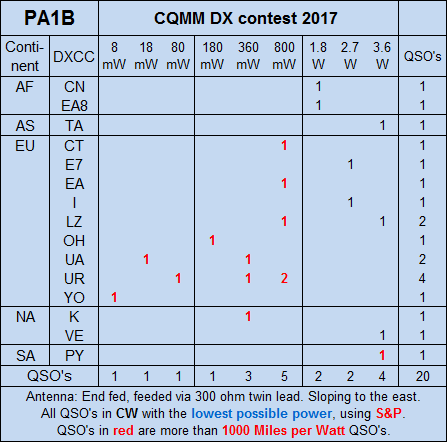 The number of QSO's in red in the table are more than 1000 Miles per Watt QSO's.